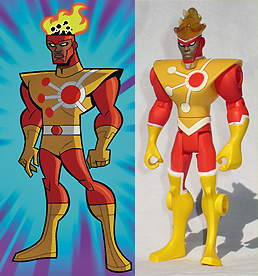 Here is the Firestorm action figure that came out in late 2009 from the Batman: The Brave and the Bold line. 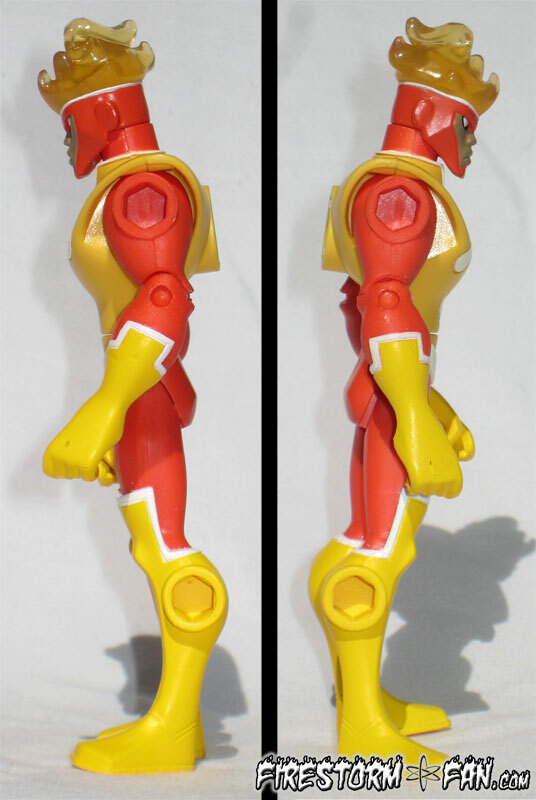 The figure represents the Jason Rusch/Ronnie Raymond fusion from the Batman: The Brave and the Bold television series. With the flaming hair, the figure is just over 5 inches tall. He’s just a little taller than the Super Powers figure, but shorter than the DC Direct and DC Universe Classics figures. 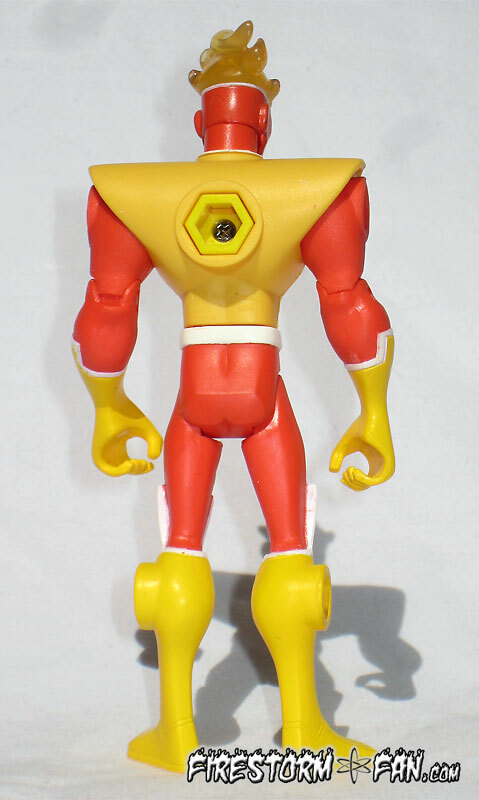 The figure was only available in a deluxe package and was apparently somewhat hard to find. 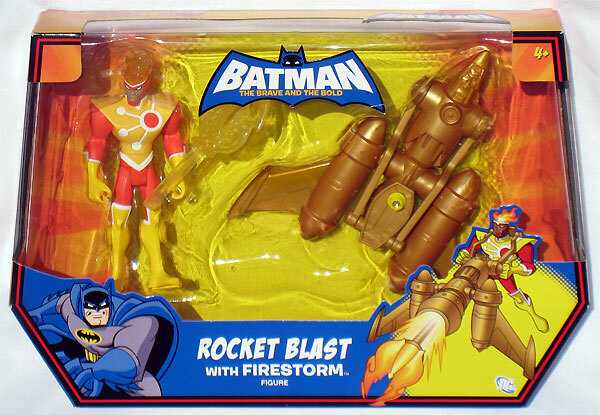 The official name of the package is, Batman: The Brave and the Bold Rocket Blast with Firestorm Figure. The rocket blast included features a flaming projectile. 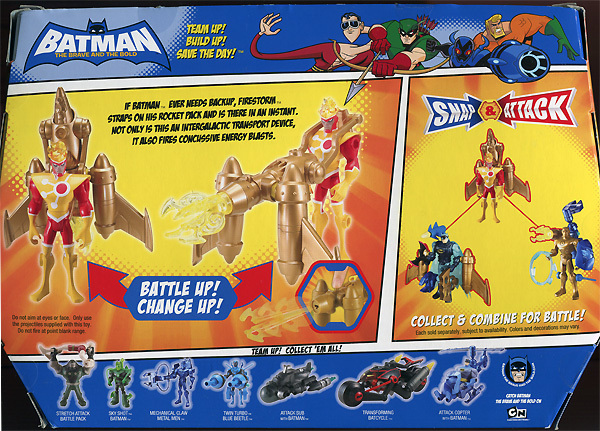 Like other Batman: The Brave and the Bold equipment, the rocket blast is modular and can be used with other figures. 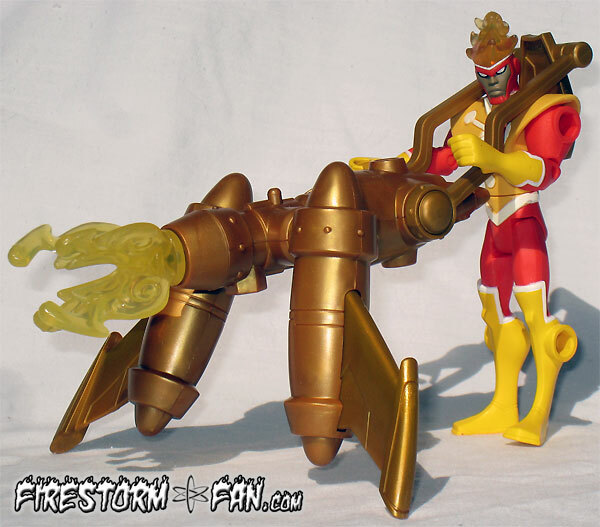 Also, the rocket blast itself is supposed to be the robot Gold from the Metal Men. I’ve always had a soft spot for the Metal Men, so this was kind of cool to realize. The belt and briefs are completely different. The boots and glove sleeves are different. 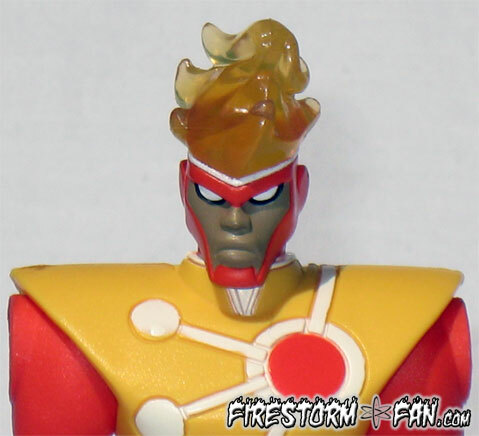 The headgear of the action figure features a white accent line just below the flaming hair. This accent line matches the white accents on the gloves and boots. Overall this is a decent figure. I like the fun styling of Batman: The Brave and the Bold. It’s unfortunate that it was only available in the deluxe pack and somewhat scarce in stores. I’d recommend eBay or Amazon if you are interested in buying this figure. Hopefully they’ll re-release the figure by itself on a card. Who knows, perhaps they’ll even change the costume to reflect the TV series. 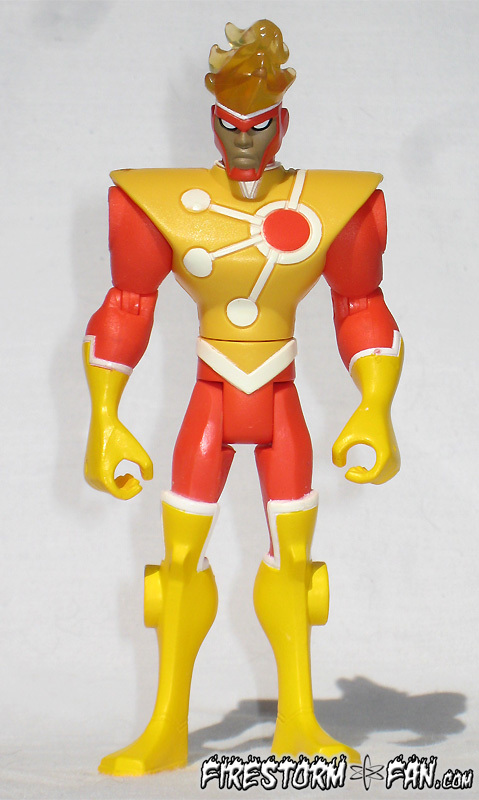 Posted in: Cartoons, Firestorm #07: Jason post-Infinite Crisis, Jamal Igle, Jason Rusch, Ronnie Raymond, Toys. That’s a nice looking Firestorm. I haven’t seen him in stores yet. I do like the Metal Men being included as “accessories,” but since Iron and Gold are probably the only ones we’ll see (in the least I’d bet the farm we’ll never see Platinum) building the team is sadly out of the question. I do like this toyline and hope it stays around for a while. I just picked up the Green Lantern Batman and he’s brilliant! I’ll be reviewing him on my blog in the next day or so. I’ve seen these in good supply at Canadian ToysRUs-es. I have bought my son a few Brave and Bold figures but I’m not sure about this one. The rocket blast might be a fun add-on but I don’t think it was in the show or is really appropriate for the character. It looks you can now find this figure at Target. I found 4 of them at my local Target (Texas). In fact I think whatever line this figure was in, is just now reaching stores-I’ve seen 4 out of the 6 figures/packs featured on the back. Update-The figure is now being reduced at Target stores. I’ve seen him as low as $4. It just depends on which Target you go to.